This letter was written by a fellow in the R.A.F. 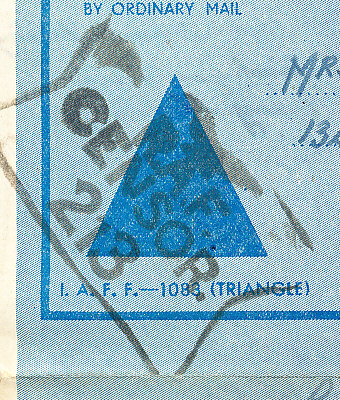 (Royal Air Force). At the time he was with No. 1 Mobile Operations Filter Room, South East Asia Air Forces, June 20, 1945 (India). From the letter….. It is with the greatest pleasure that I write this airmail hoping sincerely that it will find you in the very best of health. Many thanks for the two which you sent, one written on the 6th and one post March 9th. I was very sorry to hear about Agnes, I would rather you have told me before, I had an Idea something was wrong. I hope this letter will find her in much better hearth. Tell her not to worry about writing to me. Tell her to get herself well first. She seems to be having a rough time. I expect when Harry comes, that helps to cheer her up. Remember me to Harry when he comes up. I guess they don’t quite know they stand these days does he think he will be going home soon? So you said in your letter things may turn out for the best. Give Ag my love, and tell her to hurry up and get well again. By the way will you ask her what as happened to Yvonne, as I haven’t heard from her in a long time, maybe she as got another boy, maybe she can let me know how things stands, not that I’m worried about it. I’m writing this letter to you in the club which I mentioned in the other letter I wrote, it is the first time I’ve sat down to a table to write a letter. Nearly forgot how to do it, the radio is on, the programme at the moment is Forces Favorites, I’ve just finished a nice cup of holicks, everything in the garden is lovely, it has just finished raining. We have been getting a few showers the last two days. I had a gave of football today, first time I’ve played for along time. The side I was on managed to win one mil. It wasn’t a very good game as a lot of the chaps couldn’t play very well, but it was good fun while it lasted. Well the hill party I mentioned in the other letter, I don’t think we shall be going on it. It seems that other chaps are more entitled to it than me, so I have to wait my turn. That’s how it goes out here. Sorry to hear that some of your pen-friends haven’t been writing. I too haven’t heard from any of them, Good Pals. I was hoping to get some more money but it hasn’t come through yet. Still I can manage, as I have a bit saved up, and I think the other money will come through by the time I’ve spent my reserves, as there isn’t much to spend it on, at this place. But don’t worry about it I shall get by okay. I would rather you have the money than spend it out here.